The official Podcast outlet of the Heathen religious organization, The Troth. Visit us online at www.TheTroth.org, on Facebook/theTroth1 and on Twitter: @AtTheTroth. Music: To Hear the Trumpets Call by Hauk Heimdallsman You can find Hauk on Facebook: @HaukMusic. Music used with permission and copywrite by Hauk. We speak with Frith Forge co-organizers Robert Schreiwer (Troth Steersman) and Amanda Leigh-Hawkins (International Relations Committee) for a recap of the Frith Forth conference held in October 2017. The conference was a collaboration of the Troth and the Asatru EU Network. The European co-organizer was Haimo Grebenstein of Verein fur Germanisches Heidentum e.V. There were representatives from organizations from the U.S. and Europe as well as folks who wanted to connect with other leaders and have a good experience. Links to the organizations can be found on the Frith Forge event page. Scroll down to the Participants section and click on the logo to conect to a website. The Asatru Summer Camp will be held 28 July - 4 August in Gerolstein, Germany. Please see the IASC website for information and booking details. Attendance for the 7-day camp is as low as 230 Euros including accomodations at the youth hostel where it is held. 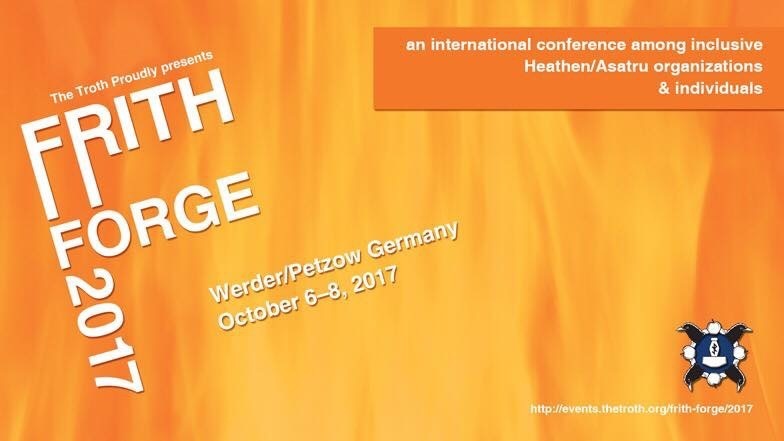 Workshops, blots, activities, and most of all - connection with other inclusive Heathens in a fun and comfortable setting. Old traditions and new. Adapting traditions to modern practice or making new Yule traditions that are right for you and your family today. A traditional song to sing around an apple or adapt to another fruit or nut bearing tree. (I have changed only a couple words of the text to honor the Gods and to make it inclusive to all who will sing.). And hoping thou wilt bear. And health to the old apple tree. (shouted)Old apple tree we wassail thee and hope that thou wilt bear. Apples now! Hats full! Caps Full! Three bushel bags full! And a little heap under the stair. Three Cheers for the old apple tree - Hip hip Hooray! Hip Hip Hooray! Hip Hip Hooray! Located on Huginn's Heathen Hof. Our Troth, vol 2. compiled by Kveldulf Gundarsson. 2nd edition (c)2007 printed by The Troth Publications. Available on Amazon Smile. Idunna: copies are availalb at Lulu.com. PDF $3/Print $6 all are copyright and published by The Troth. Please visit the websites of the artists and support their music. The Troth podcast returns with an episode shared by Gifts of the Wyrd. This episode we interview the newly elected Steersman of The Troth, Robert L. Schreiwer. The Troth is open to all who seek to know and to honor the Gods, ancestors, and values of the Germanic Heathen traditions, regardless of gender, race, nationality or sexual orientation. Join us as Rob shares his excitement at working with the organization in his new role and to continue to provide a welcome place of Heathen practice. Music: All selections on this podcast are written, produced, copywritten and used with permission by the musicians. Host: John Hyatt visit Gifts of the Wyrd on Podbean for other topics. Follow on Twitter: @WyrdGifts and on Facebook. Hail one and all! A group of Troth officers and members (and bystanders) got together to discuss the fun, frolic and faith of Yule in 2008. Said folks include, Patty Lafayllve, David Carron, Soli Johnson, Stacey Wilber, Martin "Gerd" Venerator, Mike Hicks, Sandi Carron and the littlest Heathen Kay. Copyright &copy; 2011 Patricia Lafayllve. All rights reserved.